When Mara Brennan's boyfriend leaves her three days before her twenty eighth birthday, she realizes she's stuck. Stuck in a job she hates, stuck with mounds of bills to pay and stuck standing idly by while watching her friends move on. So she creates the OM List, an identity makeover list, inspired by her friends and her new-found love for yoga. As she begins to check things off, with one hilarious disaster after another, she discovers how to become unstuck and begins to follow her own path. I thoroughly enjoyed this Canadian Chick Lit novel which I found easy to read and laugh out loud funny. Stuck in Downward Dog is chock full of Toronto details which I loved, especially having been to many of the areas she describes. I did get irritated though with the explanations of things Torontonian or Canadian which were put in parenthesis. Perhaps it was because I already knew these details, but I think it brought me out of the writing whereas if it was incorporated into the prose it might not have stood out. Regardless, these dropped off at some point and it didn’t ruin the book for me. It seems I enjoy books written in the first person much more than the third person and it became even more apparent in this novel (with the exception of Jennifer Weiner who writes the third person spectacularly). This chick lit character had just the right amount of ditz, quirk and outrageous situations along the lines of Bridget Jones’s Diary and The Shopaholic series and made me laugh out loud multiple times. Even though I wasn’t sure about most of her friends or her sister, I loved the character’s often painful transformation and was pleased that it didn’t all revolve around a man – he was only the impetus for her transformation. 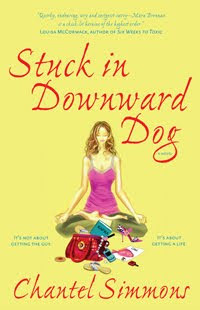 Stuck in Downward Dog is great Canadian Chick Lit and I will definitely read her new novel coming out next year! At first I wasn’t so sure I was going to get into Stuck in Downward Dog because the first couple of chapters seemed really busy. This may be because she was explaining her references of Toronto to people who wouldn’t know the places and areas of the city. As I live in Toronto and spent most of my life living downtown this seemed irritating. I got over it as it stopped after a bit and I accepted that most people reading it don’t live here and would perhaps need the tips! The story is good and I really liked the main character of Mara. She is searching for a purpose to her life when her boyfriend leaves, she doesn’t like her job and she can’t afford where she is living. It’s really painful to read about her attempts to become what she thinks she ought to be. Mara seems to think her life would fall into place if she could just become exactly like her two best friends. Her friends appear to be living the perfect lives but I didn’t care for them much! They seemed cool, distant and snooty and not very supportive of their friend. Mara does, however, have the “gay best friend” who is much more supportive and ends up being the one to gently (or not so gently sometimes) push her in the right direction. There were some parts that were hilarious and some painful moments where she gets everything wrong too (unfortunately these were funny also!) and I wanted her to succeed. I even eventually accepted that her two girlfriends were probably not so awful! All in all I would definitely read another novel by Chantel Simmons and I look forward to it!